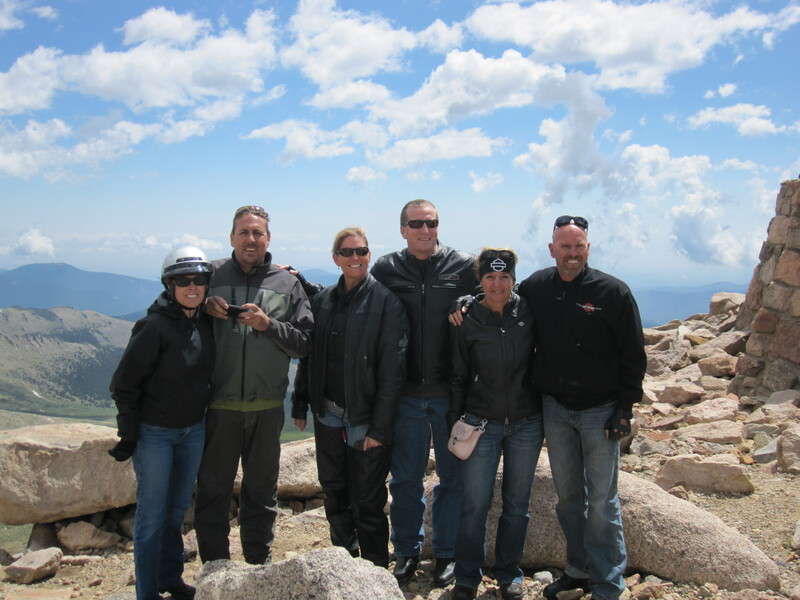 When Linda and I were in Denver with Ken and Lisa back in December we decided to put together a motorcycle ride over the fourth of July. Well everything came together the weather looked great and it worked out with all of our work schedules so we put the ride together. I had a customer coming over to Denver for a Rockies game on the 29th and an Executive briefing on the 30th. 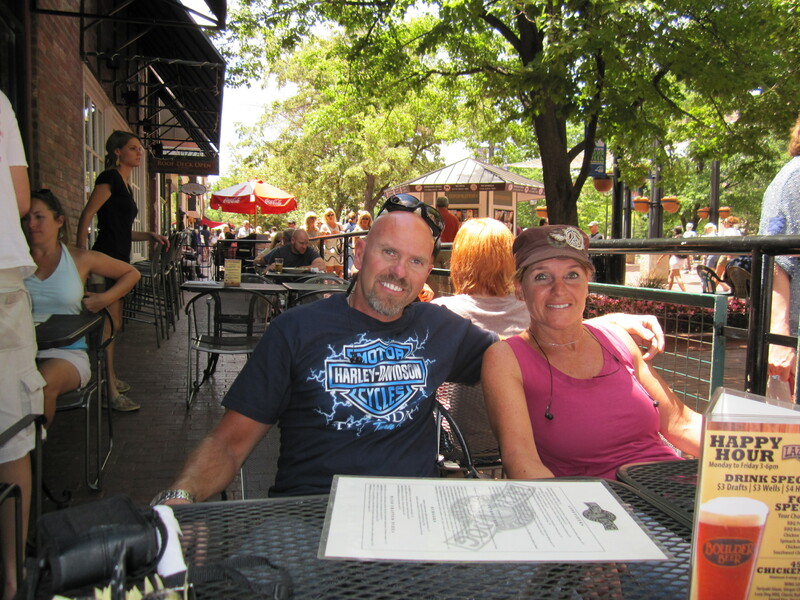 So Linda and I jumped on our bikes the afternoon of the 28th to get to Grand Junction so we would not have that far to ride on the 29th. 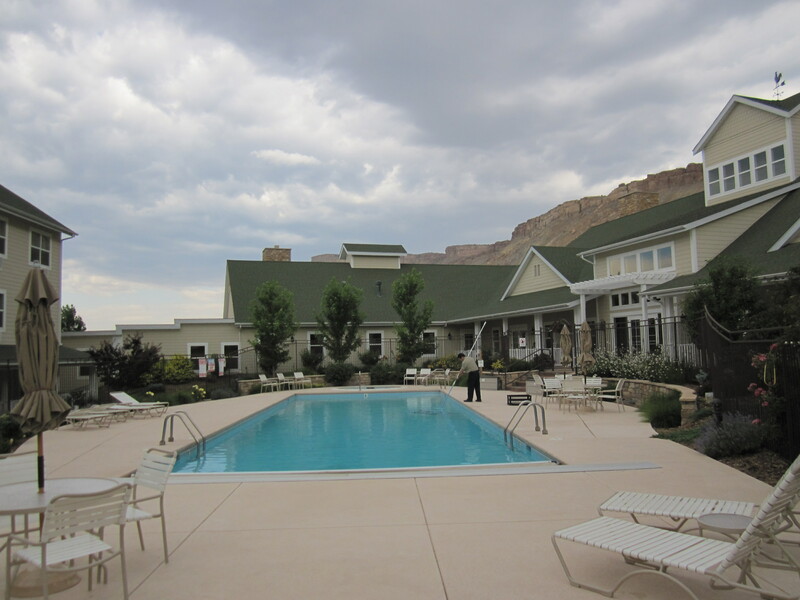 We stayed at this cool Hotel just outside of Grand Junction in Palisades called the Wine Country Inn. It sits right in the middle of a vineyard. 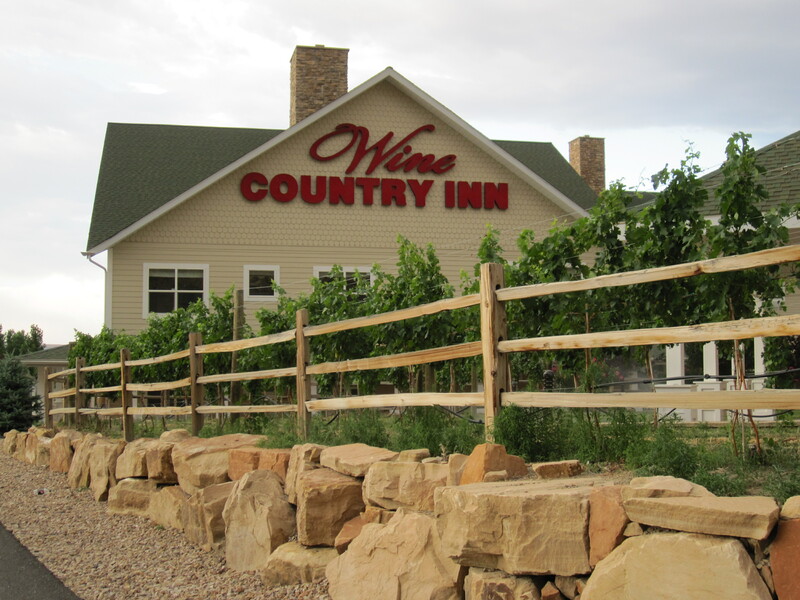 I would recommend this place because it’s not to expensive $119.00 is what they charged us and they have free wine tasting from 5:00 to 6:00 and they have a fantastic continental breakfast. This is the front of the hotel do not try to use your GPS to find the place the road does not come up. But you cannot miss it’s right off of I-70. The grapes were everywhere you looked. They just grow the grapes and the place next to them process them into wine. The pool and Hot tub area is right in the center every room has a walk out deck facing the pool. Linda and I took one our favorite wines out to the hot tub and had a good time talking to some of the other guests there. 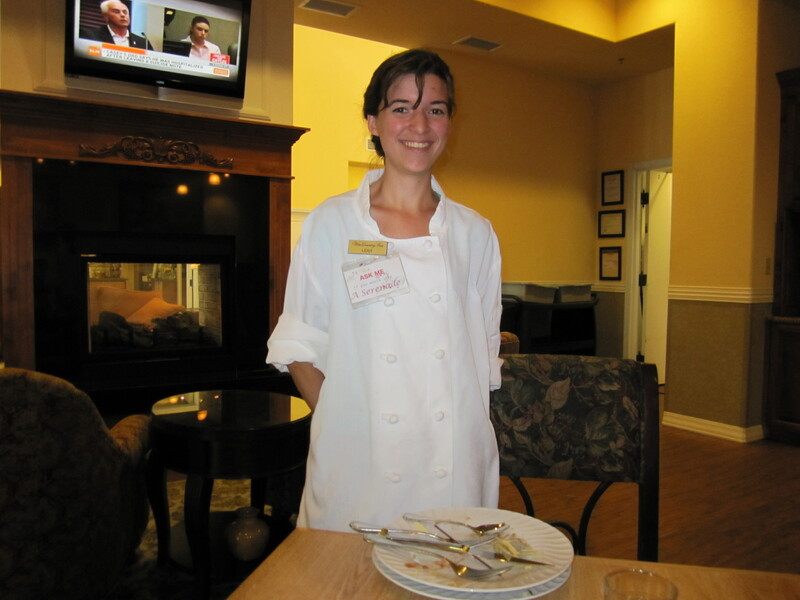 At breakfast the servers will sing to you if you want them too. This gal had a little sign on her name badge that said “Ask me to serenade you” so we did and she was so good. This gal had a voice. I’m telling you if you have a small group six at the most or you and your wife want to just get away for the weekend this is a fun place to go. The only down side is there is nothing else by the hotel. So if you’re drinking you really have to stay there because Grand Junction is ten miles away. We took I-70 in from there but had to stop at the “mother ship” in Glenwood springs. 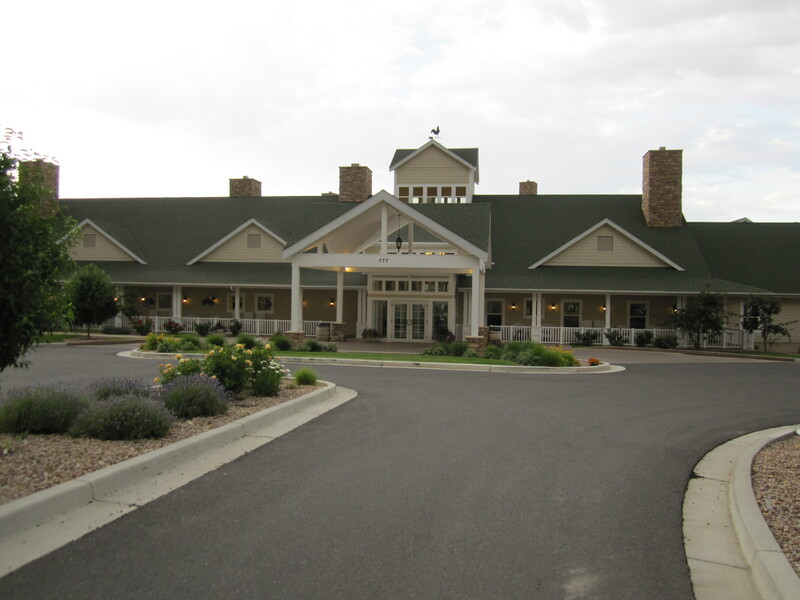 It’s called Aspen Valley but it is in Glenwood. 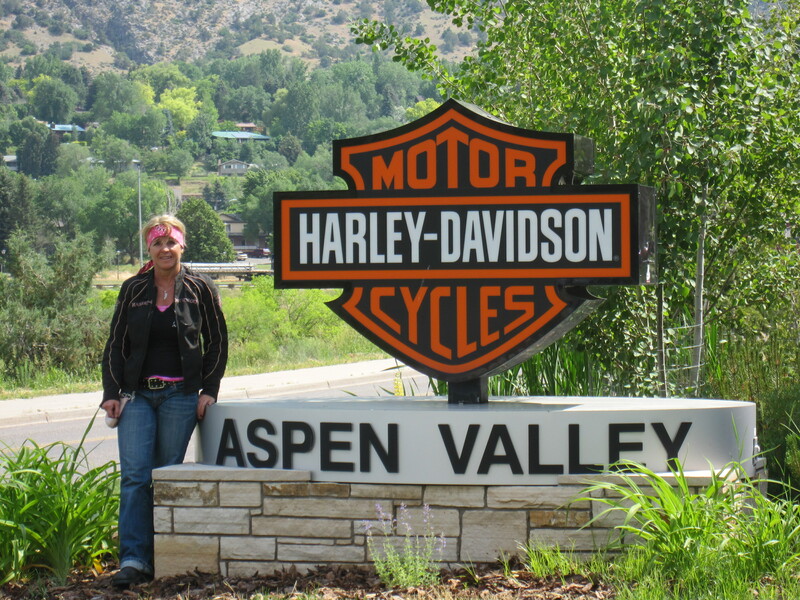 Linda and drove through Glenwood looking for the Harley dealership. The town is small but again I think it would be a fun place to spend the weekend. In fact I would go back to Glenwood before I would go back to Sun Valley, Jackson Hole or Yellowstone. 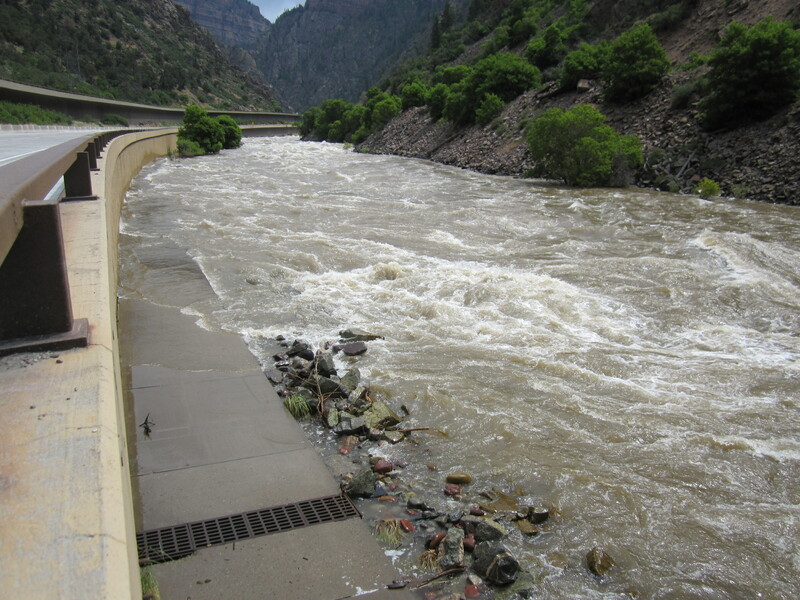 like the Utah rivers everything is running high and fast in Colorado as well this is a picture of the Colorado river if you click on it you can see how it has flooded the walking path. Here is another picture of the river it just looks angry. I don’t know how those trees are hanging on with all of that water rushing over them. We made it to Ken and Lisa’s house in plenty of time in fact just in time the winds came up so strong in the afternoon that they had to close the airport. My customers coming in had to land in Colorado Springs. We had to rent them a car to drive up to Denver in. Here we are on our in front of their house for our first day of riding. Linda, Ken and Lisa in front of their house. 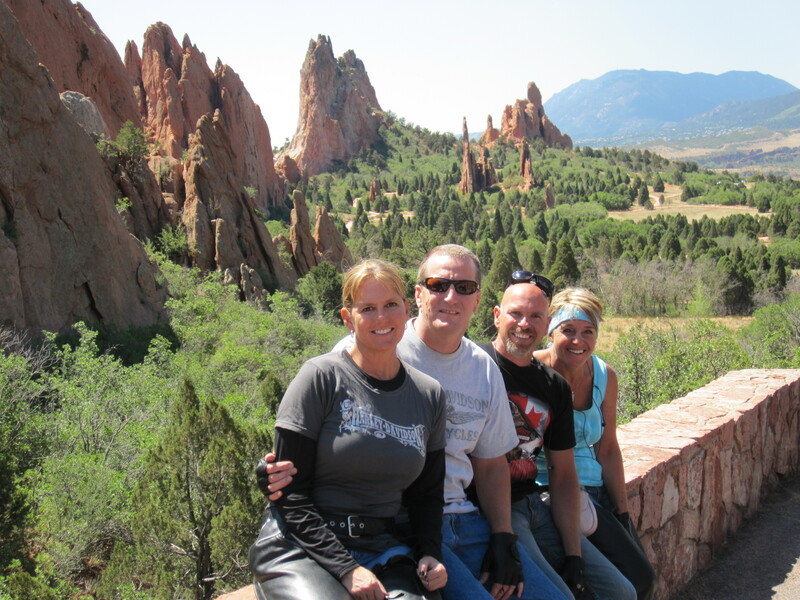 Are route took us to Garden of the Gods and Manitou Springs. The first day’s ride was fantastic I just love the route some technical riding but mostly just great mountain roads. That evening we had some great sushi and went over to the Dusty Boot for a beer or two. We had no idea they had “Music BINGO” this is a game where they play the song and the music video and you have to guess who the artist is and find it on your BINGO cards. Lisa really got into the game… just watching her get so excited made it fun for all of us. But in the end I won a BINGO but Lisa won the Black out. Notice the smile on our faces with the DJ. 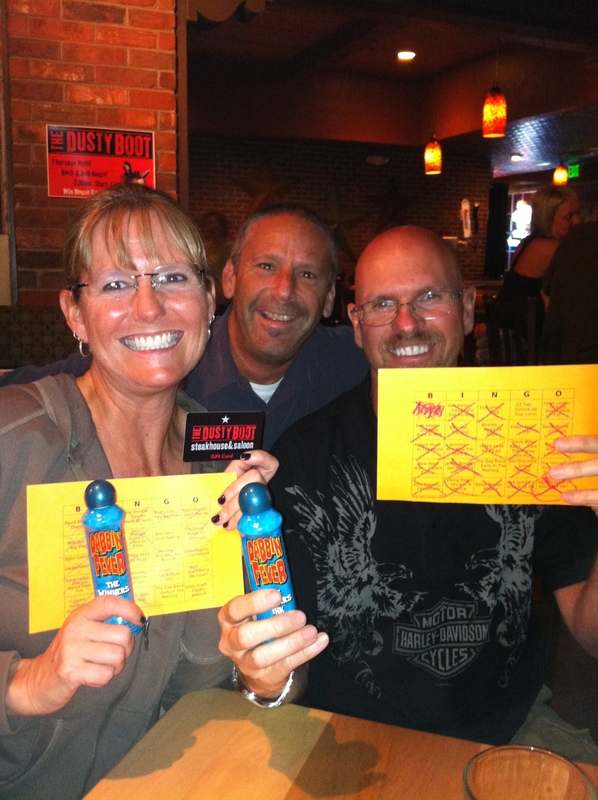 We also won our own BINGO markers for the next time we play. In the evenings Chantel, Stanton, Jessica, Linda and Ken would do a little X-Box dancing. Trust me it was fun to watch. Day two was another great ride in fact I think the best ride of all. We rode up to MT. Evans. A little known fact Mt. 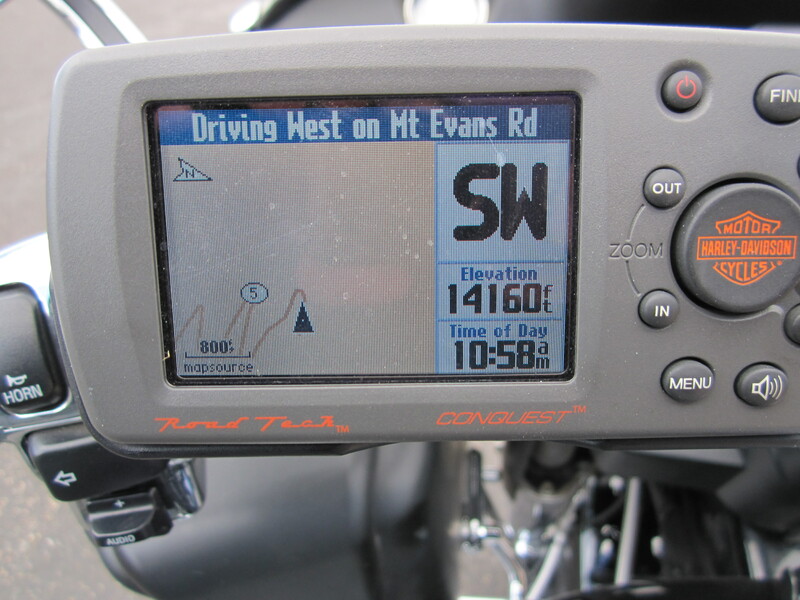 Evans has the highest paved road in North America. 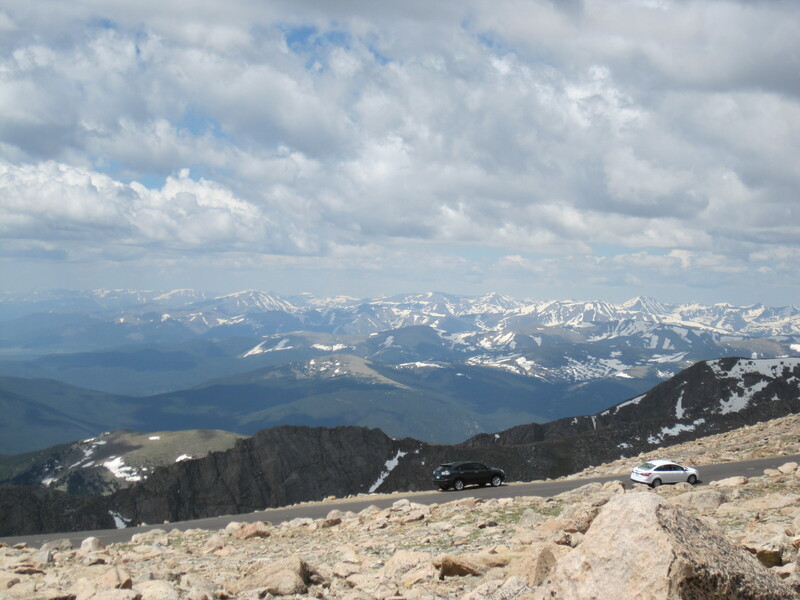 If you click on the picture you will be able to see not only the altitude but the road with all of the switch backs. Let me tell you this road is narrow and does not have any guard rails. So imagine riding up a narrow road without any guard rails and sharing the road with cars, trucks and everyone else. Linda has some stories to share if you get with her. 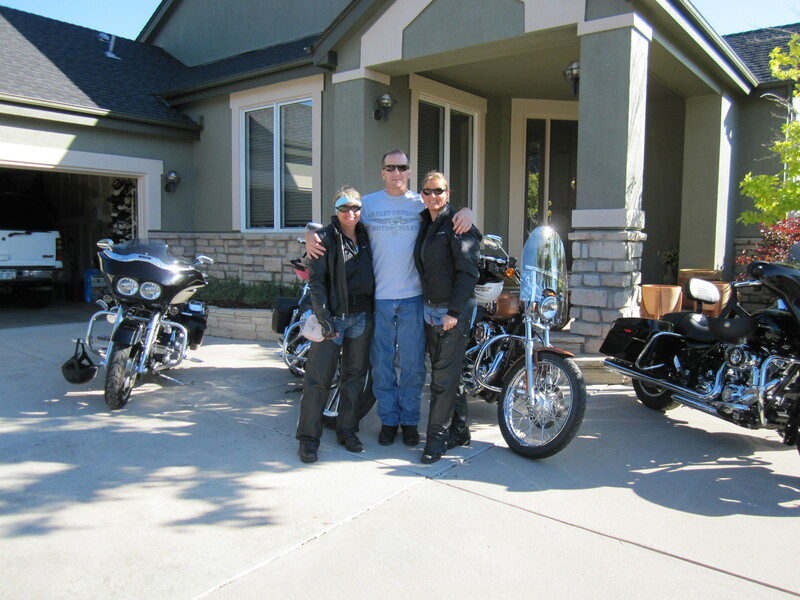 Lisa and Linda did a fantastic job of riding one of the most difficult rides I have ever done. The view from up top if you click on this picture you can read all of the other peaks you see from up top of Mt. Evans. Shauna, Jim, Lisa, Ken, Linda and I. Notice eveyone with their coats on. It was 90 in the valley and 40 at the top. 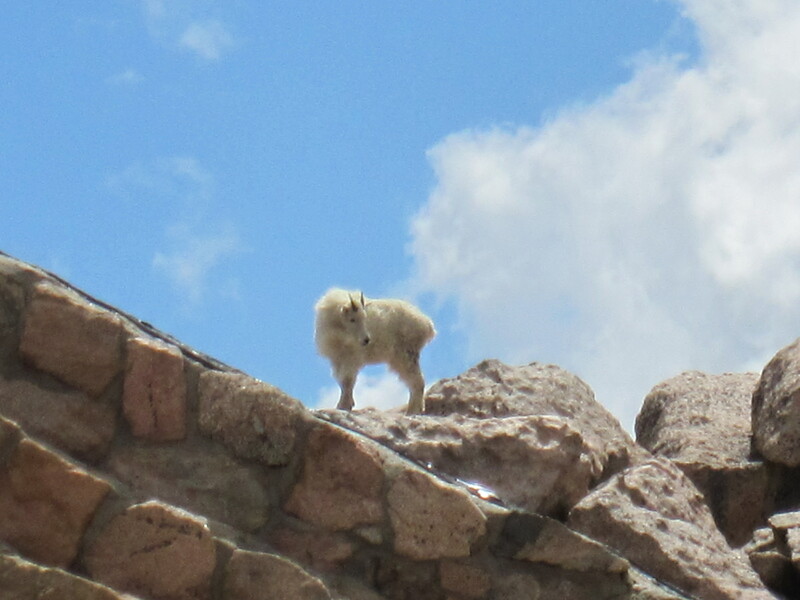 I took this picture of a Mountain Goat right on top of Mt. Evans. We saw about 15 Mountain Goats up there. 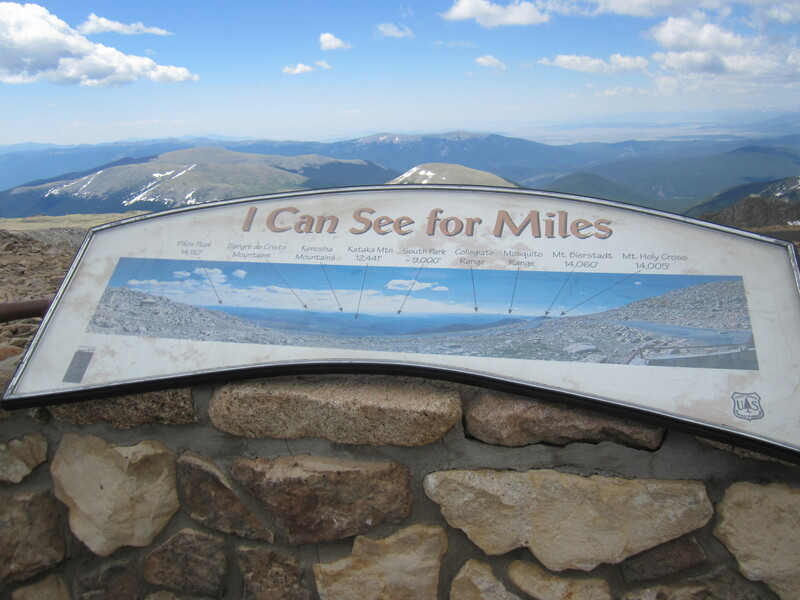 A great photo from the top of Mt. Evans. You can also see the narrow road and the drop off we were all focused on as we rode down the mountain. Saturday night Craig and Tami put on a Casino night party at their house it was so much fun. They had Black jack tables Roulette tables and a Craps table. We played all night Linda and I took second and third place with the most money at the end of the night. Here we are at the Sun Dance Cafe in Nederland. This town is famous for the Frozen Dead guy parties. It’s the little facts you find out about this towns that make them so interesting. The best part about the Frozen guy story is he was not frozen in a scientific way like cryonics… They just put the dude in the freezer and called it good and have had the frozen Dead guy party for years. She said hundreds of people show up for the party. 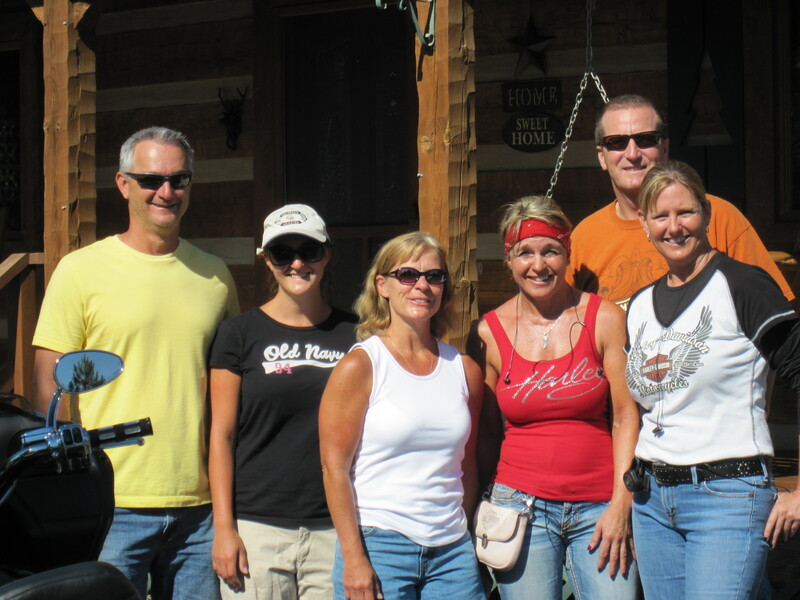 The Fourth started out with us riding out to see Sandy and her house in Elisabeth Co. 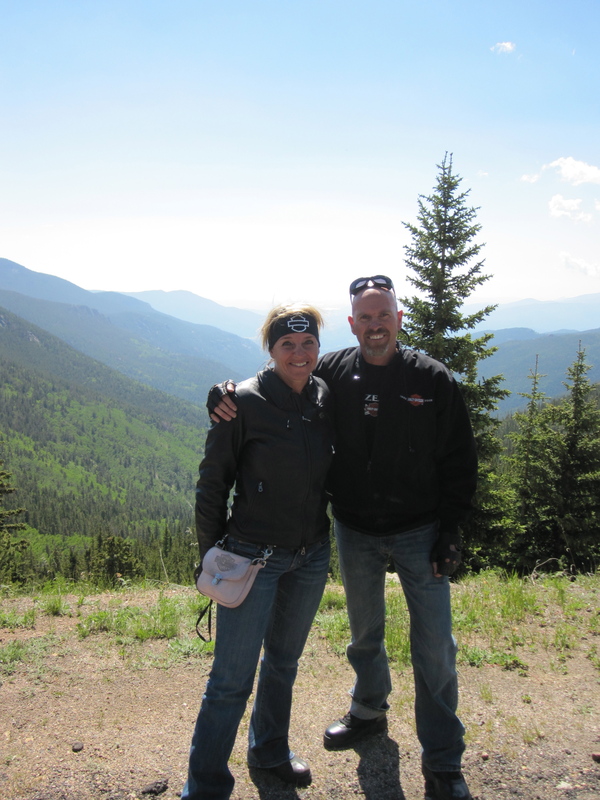 It was a fun ride out South East of Denver and way up in the mountains. We rode in and Sandy said did you see all of the deer. I looked at and Ken and said no. Well on the way out I saw about twenty deer just laying down in trees they were like rabbits everywhere. Dan, Sammy, Sandy, Linda, Lisa and Ken. We left Sandy’s house and went on a search for a good breakfast place. guess what I think we rode a hundred miles looking in every small town for a place that was open on the fourth of July. We ended up at the waffle house. 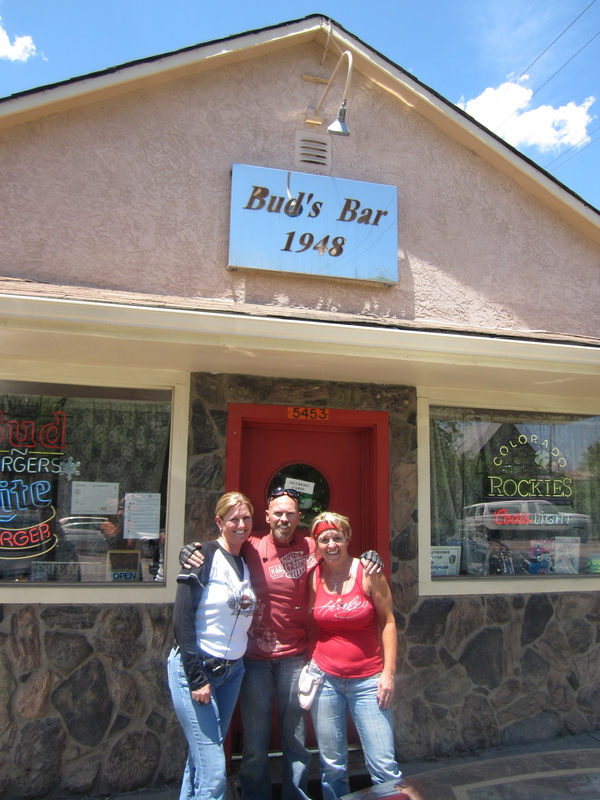 We ended our riding with Ken and Lisa at Bud’s Bar famous for their Cheese burgers… Do Not Ask for fries. they only serve chips and it’s cash only. the place is packed all of the time that is how good their burgers are. Sitting at Bud’s bar. Our burger was gone. Well we said our goodbyes to Ken and Lisa and started back to Utah. 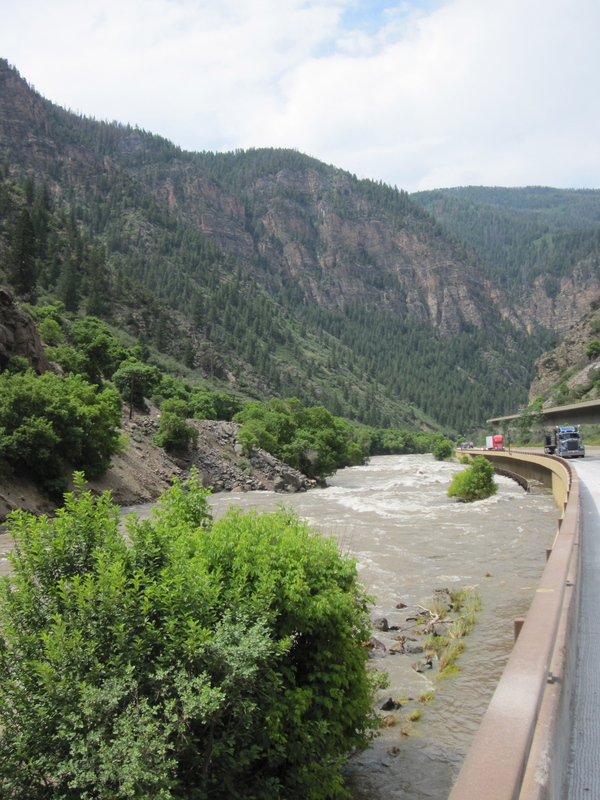 we decided to take I-70 to 40 and on to Steamboat Springs it was good ride back. 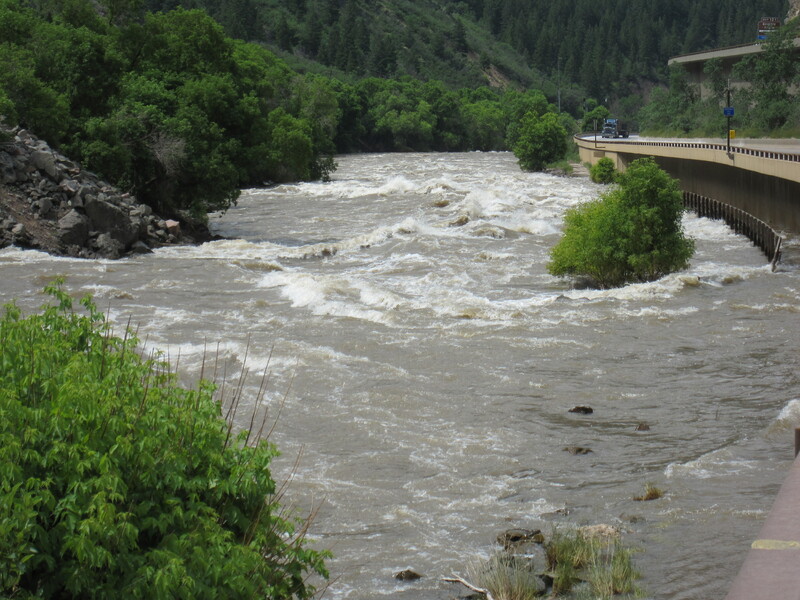 The thought was to stay in Steamboat but we got there so early that we decided to push on the Vernal. 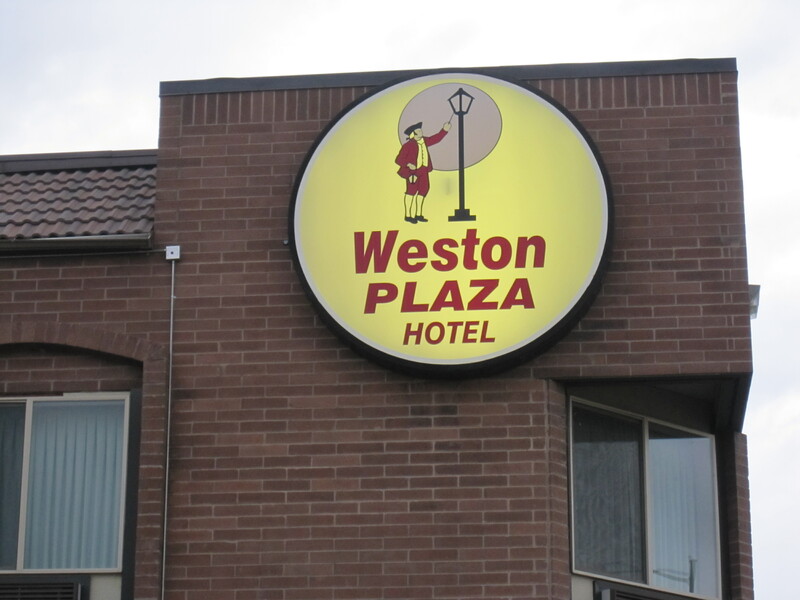 .$78 a night the rooms were good the pool and hot tub was great they had a continental breakfast that was pretty good as well. 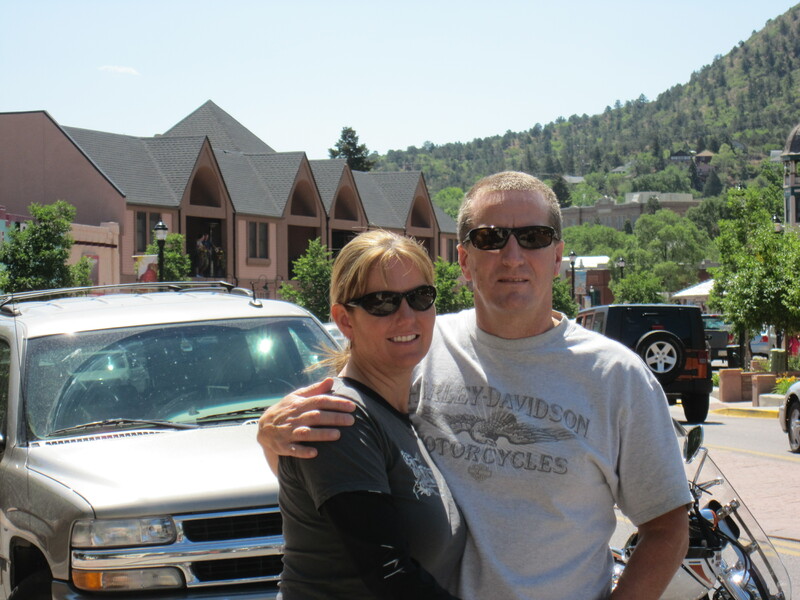 We finished up the ride by riding over Wolf Creek pass. 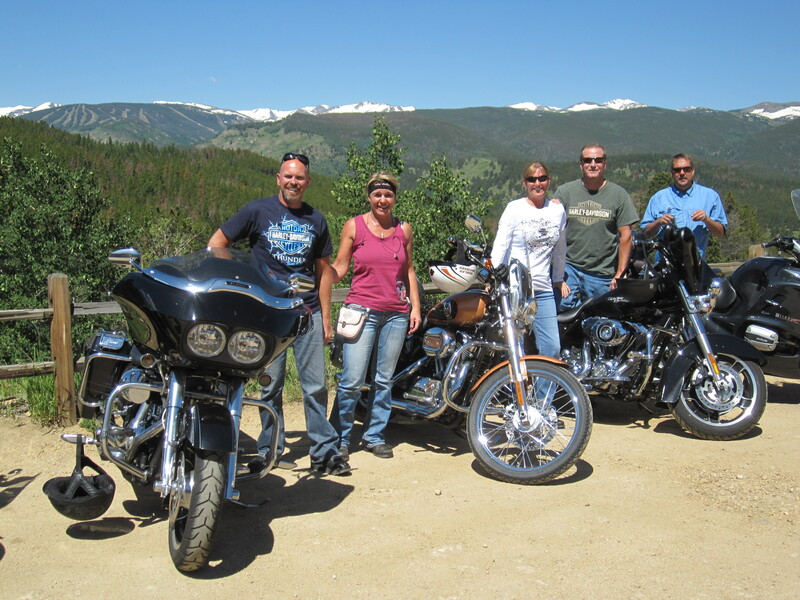 We had a great ride in Denver but even better than the ride we had a blast with some very good friends. We had a great time and some incredible rides! See you guys in a few short weeks.